Twenty years ago, it had barely been invented. Now, kiteboarding is easily the most awe-inspiring water sport, combining wave riding with the power of the wind. Kiteboarding was born in the late 1990s, out of wave riders’ desire to utilise the wind to improve their speed on the water. It is a bit like wakeboarding, but with the boat replaced by a huge, parabolic, inflatable kite tethered to the user by 20m lines, so they’re pulled along by wind- rather than horsepower. Kite propulsion is hardly new, though. Kites were used in the 19th century to pull boats and carts. In 1903, Samuel Cody developed a man-lifting kite that hauled him across the English Channel in a small canvas boat. But it was a pair of French brothers, Dominique and Bruno Legaignoux who, in the 1980s, began earnest experiments with kite propulsion that would lead to the fast, liberating sport we have today. They used the experimental kites to pull virtually anything – from catamarans and kayaks, to waterskis and skateboards. By the mid-1990s, they’d managed to convince a major windsurfing company to put money behind the development of the fledgling sport. Although it would take some time for it to go mainstream, it attracted enough interest to develop a following, especially among windsurfers. In 1998, while kiteboarding was still a fringe activity, 25 kiters (most of them windsurfing converts) took part in a small competition in Maui, jokingly christened the Kitesurfing World Championship. Red Bull took notice and the following year the event became Red Bull King of the Air, propelling the sport into the global consciousness. Over the next decade, the main challenge was improving the technology, building lighter and more aerodynamic kites that were safer and easier to use. Kiteboarding’s freedom and flexibility have also meant there has been considerable differentiation of the sport. 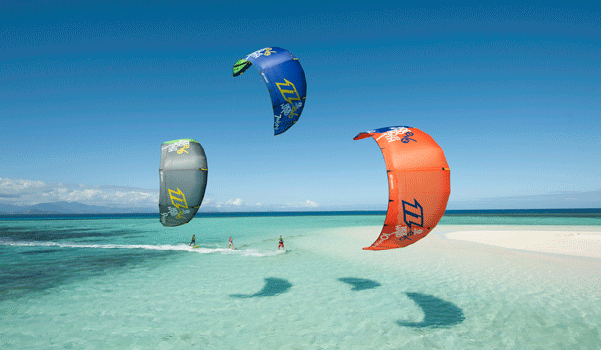 There are more than a dozen kiteboarding styles – from wave riding and freestyle, to course racing and kite cross. Consequently, kiteboarding can mean different things to different people. For some, the challenge and thrill lie in flying and surfing. For others, it’s more about handlebar passes and technical tricks. This range of viewpoints has made it difficult to set judging and competition criteria, and not all styles are equally compelling for spectators. It’s also among the reasons the sport’s bid to be part of the 2016 Olympics failed – although there’s every hope for 2020. Most of the strain, I discovered, is in fact through the legs and core, via the harness that attaches around the waist. Meanwhile, the arms are only used to steer the kite by pulling on the control bar. Still, what came as the biggest surprise the first time I tried flying a kite was the incredible force it exerts. Odd laws of aerodynamics mean it’s able to generate pulling power that’s exponentially greater than the force of the wind acting on it. This is why kiteboarders can launch with as little as five knots of wind. Encouraged by windsurfing parents, he started kiteboarding when he was just 11, winning his first junior title at the age of 15. ‘The first time I got up on the board, it was like I’d been born for this. It was weird. I got it immediately. I even landed a jump during my first session. So, I guess I skipped a lot of steps and just went for it,’ he says. By the time he finished high school last year, Oswald was consistently the top-placed South African kiteboarder in international competitions. But, while Oswald seems possessed of some kind of natural gift, the sheer power and lift of the rig can be pretty intimidating if you’re unfamiliar with the kite flying, and the sport is not without obvious dangers. Most accidents, says Martin, happen when novices underestimate the kite’s pulling power, take silly risks, disregard prevailing conditions or lack the required knowledge of what size kite to put up in particular wind conditions. With zero kiting experience, plenty of trepidation, and a knack for fumbling anything requiring co-ordination, I was able to get up and riding with about 20 hours of lessons – an average training schedule, says Martin. The key element was learning to read the wind and then using that knowledge to effectively fly the kite. My instructor had a few tricks up his sleeve to help me ease into it much faster than I would have going it alone. My first lessons in kite control took place on the beach, using a small training kite with shorter, easier to control lines. I was taught how to observe the ‘wind window’ (a 180° arc in which the kite flies) and wrap my head around steering the kite in the middle of that window, feeling where the wind force is at its strongest. It took a while, but the initial beach training built my confidence with that force – enough to believe I would be able to harness it to get myself out of the water. With the basics of kite control now in hand, my training moved into the water, where things became a lot more fun. Initially, I worked without a board, getting used to the sensation of being pulled through the water face first – ‘body dragging’ my instructor called it, as he taught me how to use my body as a rudder. Once I had the hang of that, the board was strapped on and I tried my very first water start, lifting up and riding on the surface until I was finally ready to move upwind, and soon confident enough to do so without anyone holding my hand. And tricks? Oswald says that, with a year’s experience, I should be able to start doing handle passes, where I’ll spin round and pass the control bar from one hand to the other. Frankly, I’m pretty happy being able to launch and experience the brief sensation of flight. Perhaps I’m not leaping 20m into the air quite yet, but – for those few heart-stopping moments when I am looking down on the world, flying without wings – I experience a vivid sense of unfettered freedom, all other thoughts melt away and I feel like nothing can bring me down. Except gravity, of course. 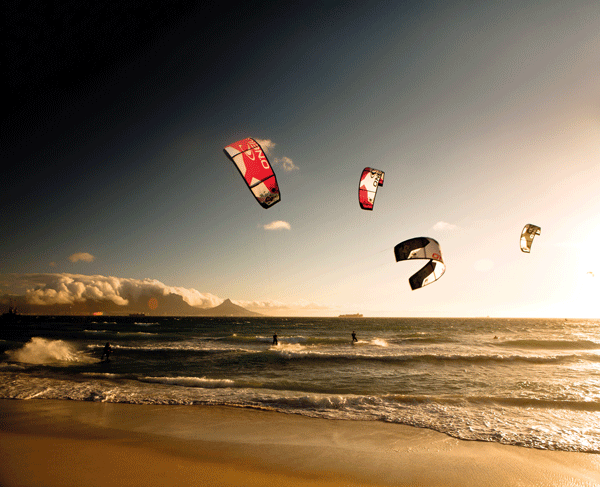 Kiteboarding happens virtually all along the SA coast, as well as on lakes and dams, so long as there is some reliable wind. 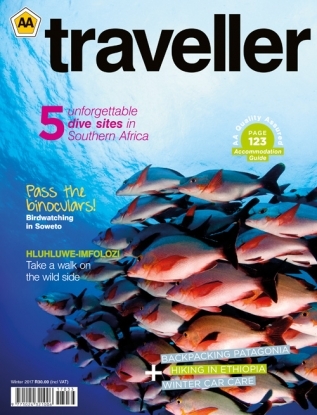 Blouberg, Big Bay, Melkbosstrand and Muizenberg are favourite locations in Cape Town – considered a global hot spot for the sport. Langebaan, about an hour north of Cape Town, is an ideal training ground, thanks to flat water and frequent wind on the lagoon (especially from October to March). 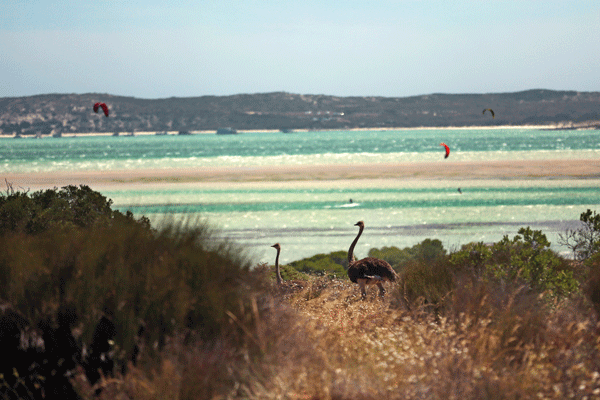 While there are numerous specialist stores offering lessons and selling or hiring equipment, Windtown in Langebaan is the first kiteboarding ‘resort’ in the country, with in-house instructors and gear for rent. Since kiteboarding equipment (board, kite, harness and ropes) isn’t cheap, it is best to get a grip on the sport before making any major investment. Opt for lessons with equipment included and speak to your instructor about the kind of kite that’ll be right for you. Consider buying second-hand gear to start with. Ongoing design improvements mean hard-core kiters upgrade regularly, so used equipment is often in decent nick. And, for safety’s sake, while you’re learning the ropes, never kiteboard alone.